"The characters' backstories are complex and moving, and the unpredictability of the disease will break readers' hearts. Teens will clamor to read this before the film version releases in March 2019." --Booklist "November 1, 2018 "
A novel about teenagers with Cystic Fibrosis? When I was a teenager in the fifties, there was Ellen, a girl in my school who had “something wrong with her lungs”. I remember her coughing, sometimes breathing noisily and sitting on the bench when the rest of us had PE. I remember the adults whispering “So sad” and “She’ll die young”. We stayed away. Maybe death was infectious. Ellen died soon after I graduated. That’s when I found out that it was cystic fibrosis that killed her. Now 60 years later I read about Stella, Will and Poe, normal teenagers, except there is nothing normal about their lives. They are in a hospital struggling to stay alive. The center of the novel is a love story. Stella and Will fall in love for the first time in their lives and grapple with the fact that it can be fatally dangerous to touch each other. But it’s also a story about friendship and it’s these friendships that are deeply moving: the friendship between Stella and Poe, who have spent months and months of their lives in adjoining hospital rooms, between Stella and her friends Mya and Camilla, who come to plan for their senior trip, which Stella won’t be able to attend, between Will and his friends Jason and Hope, who get an hour of private time in Will’s hospital room, and finally between Poe and his friend and lover Michael, who Poe pushes away because he doesn’t want him to get hurt. These friendships are special because they have nothing to do with pitying a person with a fatal disease. They are friends because they are important to each other. I love the kids and their story and I hope that there never will be another Ellen, who is an outsider because people are afraid that she’ll die on them. 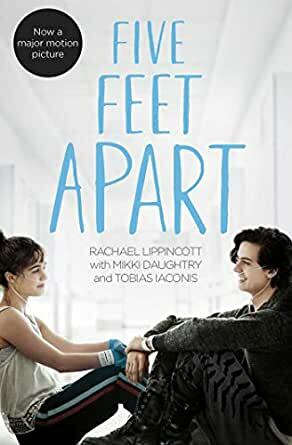 When I was a teenager, I would have lopped up FIVE FEET APART written by Rachel Lippincott from a screenplay of a movie of the same name premiering March 2019. I loved stories about sick and dying people, no matter how sappy or unrealistic. FIVE FEET APART adds a new twist on sick-lit by adding the very real scenario that two cystic fibrosis patients cannot be within six feet of each other, for risk of life threatening cross-contamination. 4. Realistic medical procedures (I’m okay with fictionalized treatments/meds as long as they have a basis in reality). Although predictable, FIVE FEET APART did all four relatively well, from my perspective of not having the illness. Sufferers may feel differently. Since the screenplay preceded the novel, character development outside CF was lacking. Lippincott gave each character a trait or two and ran with it: Stella organized rule-follower, Poe gay POC, Will artistic rebel. To be fair, CF can be a lifeconsuming illness. FIVE FEET APART, at times felt like tropeapalooza. To be fair, kids dealing with life threatening illnesses live with different timetables than those who don’t. Instalove on a hospital ward between two almost adults dealing with the same illness is more forgivable than in other settings, however the story spans over only a few weeks which feels more like instalove on steroids. I’d be most interested in how teenage CF sufferers felt about the book. They’re main characters in so few books, writers owe them a lot of realism and excellent storytelling. FIVE FEET APART is one of those books I’d have loved as a teen, then reread in my twenties and wondered why I ever liked it.